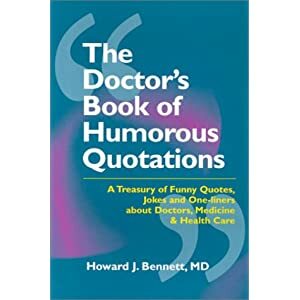 The Doctor’s Book of Humorous Quotations « Howard J. Bennett - Pediatrician and Author in Washington, D.C. The book presents more than 1,700 jokes, quotes, and one-liners compiled from a variety of sources: medical journals, books, magazines, the Internet, movies, television, remarks made on rounds, and lectures. The text is organized alphabetically allowing readers to browse through the book randomly or focus on particular topics of interest. Subject headings run the gamut from academia and bedside manner to case reports, lawyers, night-call, and turfing to name a few.